Home > Lithium Polymer > Li-PO Safe Charging Bag - 12" x 9" size. Li-PO Safe Charging Bag - 12" x 9" size. Made of specially-treated synthetic material. 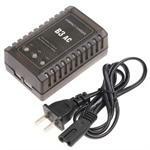 Permits safe & secure chrging of your Li-POLY (and Li-ION) battery packs. Fire-retardant, tear-resistant, and fully re-useable. This 12" x 9" is suitable for nearly all R/C hobby Li-PO batteries. If you prefer a smaller-size Li-PO safe charging bag, see the 8"x7" model (below). 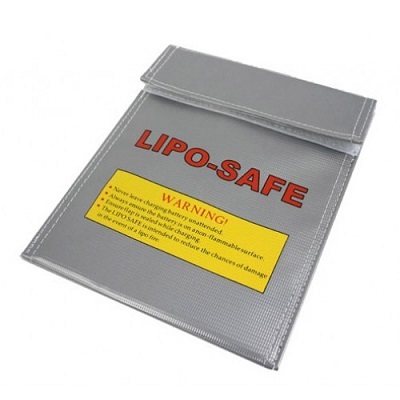 Li-PO safe charging bag - 8" x 7" size. $ 9.95 each. 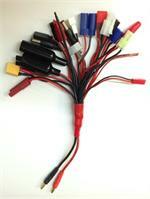 Specially treated synthetic bags for safely charging your Li-PO, Li-ION, and LiFe battery packs. Fire-retardant, tear-resistant, and fully re-useable. SuperSquid: Ultimate Multi-Connector charge Adapter for RC hobby. Banana plugs at one end, with red JST, micro JST, Kyosho, EC3, EC5, Futaba, JR, HiTEC, SPEkTRUM, red T, Tamiya, Futaba Tx, JR Tx, PowerPole, XT60, Red 4.0mm, ELCO, glow plug, wire leads.